The “Calendar” page is a user friendly scheduler, it shows a reservation calendar with all scheduled appointments organized by employees, services, and locations. You can quickly find relevant data by using services, locations, and employees filters. There are five available calendar views: “Month”, “Week”, “Day”, “List” and “Timeline”. “Week” is the default calendar view. It displays seven columns, each representing a day of the current week. You can navigate through the calendar booking system by clicking on the arrows in the top left corner of the calendar. By clicking on arrows, you can move one step forward or one step back (by a month or week for example). If the calendar is in “Month” view, it will move the calendar forward/back one month. If the calendar is in “Week” or “List”, it will move the calendar forward/back one week and lastly, if the calendar is in “Day” or “Timeline”, it will move the calendar forward/back one day. Between navigation arrows, you can click on “Today” button to move the calendar to the current date. You can also move the calendar to an arbitrary date by selecting a single date in the datepicker that can be opened by clicking on the arrow that is displayed next to the header’s title. Date & Time formats in the calendar booking system will be used from “WordPress Date/Time Settings” and the frequency for displaying time slots (calendar grid) on “Week”, “Day” and “Timeline” calendar views will be used from “Default Time Slot Step” setting. The first time slot that will be displayed for each day will be two hours before earliest beginning working hours and the last time slot that will be displayed for each day will be two hours after the latest ending working hours. Working hours are time slots on the calendar and are displayed in white. “Day” and “Timeline” views display employees as columns or rows. For the “Day” view employees are rendered in the headings. “Timeline” view provides a view with a horizontal time-axis and with employees as rows. In these two views, if an employee doesn’t have an appointment for the selected date, it will not be displayed in the column or the row. Employees breaks will be displayed in grayd for these two views. All events on the calendar used to store information about appointments. Each appointment stores all of the information about your appointment in a single event. Event resources are used to provide information like the start and end time of an appointment, an employee assigned to it, location, service, customer(s) and status. 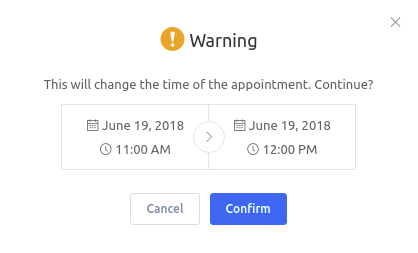 Appointments are colored by the service color. Events that don’t take excessive space will not show all the information about the appointments, but you can see the information by hovering on the single event. 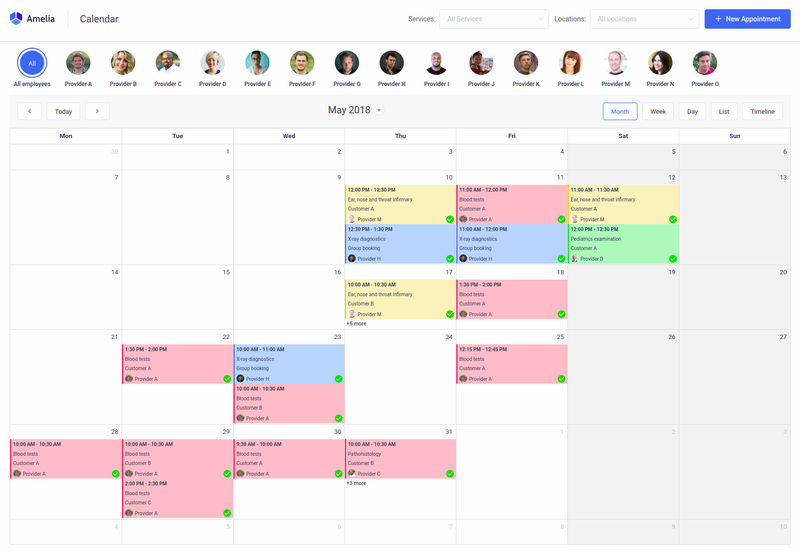 Future appointments can be rescheduled by dragging the event in the calendar. Upon dragging, you will be asked to confirm the change of the appointment’s start time. It is not possible to drag appointments into the past, outside of an employee’s working hours or during an employee’s breaks. You can also click on the appointment that is in the future to edit the information from appointment’s modal. 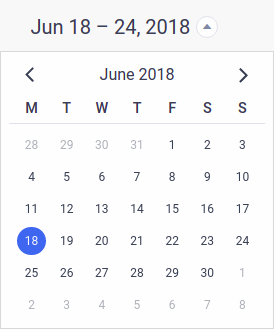 From the “Calendar” page you can add a new appointment by clicking on the “+” button in the bottom right corner of the page, or by clicking on the “New Appointment” button in the right upper corner.